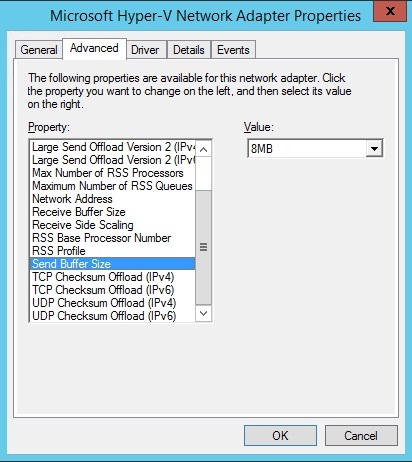 I have a webserver on a Hyper-V platform as a virtual machine running Windows 2012 Server, and what I noticed was how poor network performance was on long distance networks due to the way TCP works. Local traffic performed optimal, however anything greater to a destination 100ms+ latency , network throughput suffered. 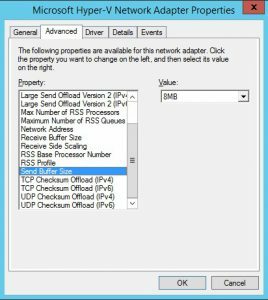 I managed to discover a tweak on the actual Hyper-V Network Adapter on the virtual machine by adjusting the send and receive buffers. 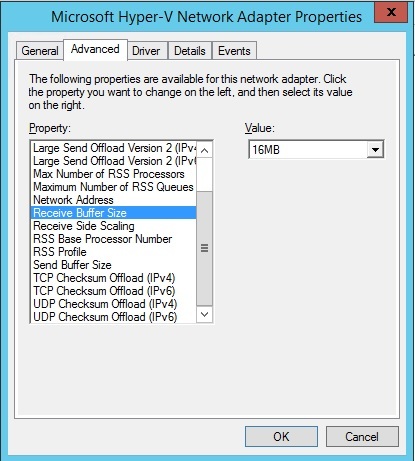 I found that a “Receive Buffer Size” 16MB and “Send Buffer Size” 8MB was optimal and significantly improved network performance on response time and single threaded downloads from the webserver. I have included the below images to assist in making the changes and locating this. 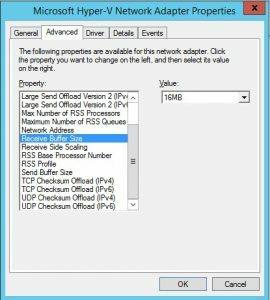 I hope someone finds this useful and it also improves your virtual machine network performance!